In a scene from the film "Annie Hall" Woody Allen plays a young child (Alvy Singer) who has been taken to the doctor by his mother. It seems that he has been refusing to do his homework, saying that there is no point. He has picked up on the idea that the Universe is expanding and has concluded that at some point it will expand so far everything will just fall apart. Totally exasperated, his mother at one point snaps at him, "You´re here in Brooklyn. Brooklyn is not expanding!" Alvy should listen to his mother. On large scales the Universe is merrily expanding, even accelerating, but on local scales, from Brooklyn to galactic distances there is enough matter to keep everything bound together. Dr Somak Raychaudhury from Birmingham University talked us through the latest findings about how our Solar System, Milky Way and Local Group are moving through time and space. Our Sun and the planets are located on the inside of the Orion Arm - one of the many spiral arms that make up our spiral galaxy the Milky Way. If you could look at our galaxy from above it would look something like a giant catherine wheel with a slightly barred central bulge. If you peered little closer you would be able to see that we are embedded in a relatively dense cloud of interstellar gas which has been given the rather unscientific name the "Local Fluff". The Sun, with the rest of the Solar System in tow, orbits the centre of the Milky Way at about 217 kilometres per second which equates to a staggering 485,000 mph. Our destination aboard `spaceship Earth´ is in the general direction of the star Vega near the constellation of Hercules. To be able to take in the views of a whole orbit of the Milky Way we would need to somehow attain a lifespan of 250 million years. On even larger scales the Milky Way is just one of around 25 others that form a grouping of galaxies known as the Local Group that measures over 10 million light-years across. The largest two members, are the Milky Way and Andromeda (another spiral galaxy) with small companion galaxies being found every year to add to the total. The Milky Way and Andromeda are actually on a collision course at speeds of 130 kilometres per second (300,000 mph). However, you will be relieved to hear that this `pile-up´ is not due for another several billion years. The Local Group as a whole is travelling towards the constellation Hydra at speeds of 600 kilometres per second (1.34 million mph) towards an even larger grouping known as the Virgo Supercluster. Zooming out to these levels the large scale structure of the Universe suddenly starts to become apparent. 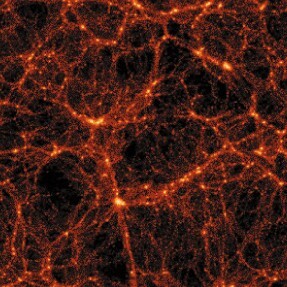 Huge bubble-like voids are demarcated by galactic threads and sheets, with superclusters appearing at their intersections. In other words - we live inside foam, which gives quite a new perspective to bath-time!